Send account information and passwords securely through our encrypted portal. From time to time, Mediavine may need access to your site to assist you with ad-related issues. Send your account information safely with our Secure Support Messaging. If we ask you to submit a password to us, you will visit https://vault.mediavine.com to send your password to us. Messages will self-destruct after a time limit. 2. Select the time limit for the message's self-destruction. 3. Select "encrypt message" so the password can make it to us securely. When at all possible, set up a separate user account for us to use, and make sure to change the password for FTP and host logins once the work is completed. 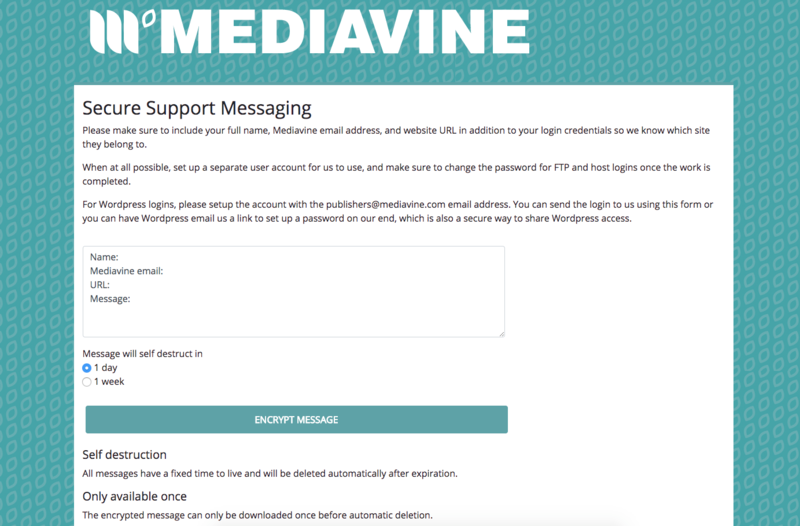 For WordPress logins, please setup the account with the publishers@mediavine.com email address. You can send the login to us using this form or you can have WordPress email us a link to set up a password on our end, which is also a secure way to share WordPress access.